This is a tutorial on how to strip weapons from a player. 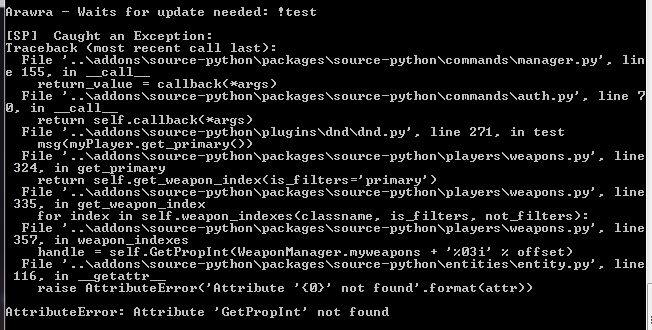 Of course, this will only work on games that have the dynamic functions for DropWeapon and UTIL_Remove implemented. If you do not remove the weapons, you can also use the drop_weapon functionality to cause players to drop their weapons (including grenades and even their knife). bit off topic but, Can we give weapons yet? # Is the server running Windows? # Is the server not running Windows? Yeah, sorry, just threw that example together real quick last night. Fixed in post above. Hi, I would like to make an addon to make player drop the weapon they are holding if I shoot their hands. Is this possible in CS:S and CS:GO? # Is the player not damaged on left or right hand? # Is the player dying? # Is the weapon not valid? Big bump but wanting to learn. [SP] Addon 'strip' was unable to be loaded. arawa, your link has nothing to do with adrian's problem. Please go to ../cfg/source-python/core_settings.ini and "enable" tracebacks. You will probably get errors about undefined methods, because these scripts were made before the naming scheme change (from CamelCase to names_with_underscores). Thanks Ayuto turns out I all packages are before the data_path change, downloading the latest ones from github. I've updated and all loads fine but I am getting error on line 172 on entities\enitity.py int has no attribute for fset. Weapon functionalities are not updated yet. Also, I'd rather suggest you using PlayerIter instead of PlayerGenerator. Was give_named_item() removed/moved from PlayerEntity? Is there a equivalent for it yet? No, give_named_item still exists for both cstrike and csgo. Though, the signature might have changed for csgo. Eventually, that will use a virtual function (like it currently does on cstrike) on csgo as well. satoon101 wrote: No, give_named_item still exists for both cstrike and csgo. Though, the signature might have changed for csgo. Eventually, that will use a virtual function (like it currently does on cstrike) on csgo as well. No need of a signature. Are there any ways to strip/drop player weapon for now? Sorry, I keep forgetting to reply to your post. The code in the first post should work with minor changes (ie GameEvent.GetInt should be game_event.get_int), however my tests show that dropping seems broken for the current released version. I have been working on an update to the BaseEntity system. Once it is finished and has been committed to the repository, I will try to remember to update the code above and verify that it works.